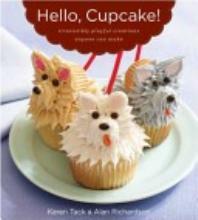 A year or two ago my parents bought me the book Hello, Cupcake! since I had taken a cake decorating class and enjoyed it. The book has a lot of cute decorating ideas and recipes. A few weeks ago we made the chocolate cupcakes with cream cheese icing. They were SO good! The kind of good that you have to use all the will power you can to not polish off the plate! Hubbie took the remainder to work so that we wouldn't be tempted! For Buggy's birthday, we decided to try out the carrot cake with cream cheese icing! Also delicious! This cream cheese doesn't have a "after taste or bite" to it. I think the butter helps mellow it out. Whatever the reason, this is definitely a family favorite! 2. Whisk together the flour, baking soda, cinnamon, baking powder, salt and nutmeg in a medium bowl. 3. In another bowl, with a mixer on medium speed, beat the eggs, brown sugar, sugar, oil and milk until light and thick. 5. Bake until golden and a toothpick inserted in the center comes out clean, 20 to 22 mins. Remove and cool. 1. Combine the cream cheese and butter in a medium bowl. Beat with a mixer until light and fluffy, about 3 mins. 2. Gradually add the sugar and 2 tablespoons of milk and beat until smooth. Add vanilla. And add remaining 1 tablespoon of milk if the mixture is too thick. Buggy is what we call our youngest son and I figured bugs made out of candy would be appropriate for his celebration! Everyone Our oldest sons enjoyed the candy! The icing and both cake recipes that we've made are SO good! Once you eat these homemade cakes, you will never be able to go back to a box cake or tub of icing! I really wish I could "go back" sometimes, because it would make things a lot quicker and easier...... but once you eat one of these YOU DON'T want to go back to any store bought cake! Delicious!! !